Februari 3th 2014 – Wipeout! 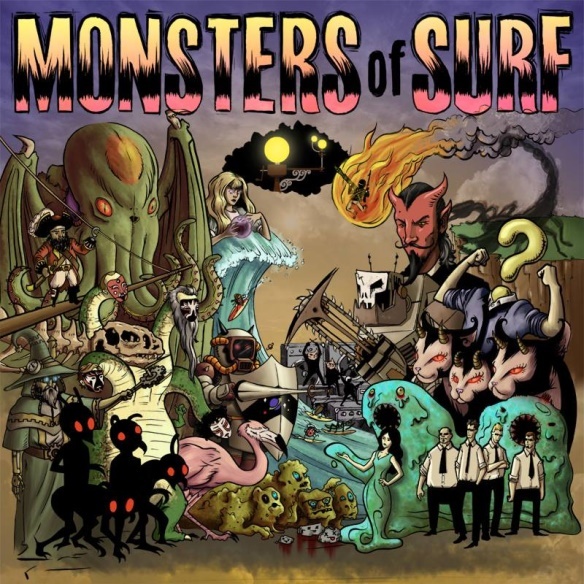 MONSTERS OF SURF is out! A classic compilation album with 22 heavy surf tunes from all over this planet, including Spaceguards’ “La Donna D’Oro”. Spaceguards track Strangelove is this weeks NorthSeaSurfClassic at North Sea Surf Radio and is also featured on the Best of the North Sea Surf Festival compilation album! Tomorrow we’re off to Italy, Saturday night we’ll climb the main stage of the Surfer Joe Summer Festival in Livorno, the world’s #1 surf music event. Livorno is probably the coolest and definately the most reverberated place to be this weekend! At 20:30 it’s showtime for Spaceguards. Debuting this Saturday: our new man on space bass, Gianni Schepens. “Multivision is an extraordinary and eclectic instrumental album. It combines various elements of surf, space, punk, hot rod and spaghetti western into an unusually compelling mix of sounds. The interstellar overtones let your imagination run wild. Multivision conjures up the awe and mystery of space.” Read the complete song by song review. It’s official! Spaceguards will play at the world’s #1 surf music event, The Surfer Joe Summer Festival in Livorno, Italy (June 21-23). A fantastic line-up of bands from all over the planet! Check the Surfer Joe Festival website. Showtime for Spaceguards: Saturday June 22nd, 20:30. Towards the end of 2012 our debut album MULTIVISION came out, receiving raving reviews all over the world! Two songs from the album, WHALE and STRANGELOVE, were featured in the soundtrack of a Dutch (VPRO) TV documentary. And, as we mentioned earlier, RIO JARA and PLUTO were used in a commercial for Volkswagen. In the course of this year we will start playing live again. We are planning a small trip to Italy in June… More on this soon! September 16th 2012 - Brasil! MULTIVISION has arrived in Brasil! Spaceguards debut album is now for sale on The Dead Rocks website, which is not just home to a great Brazilian surf band, but also THE place in South America to shop for quality surf, garage and related music. Obrigado, Marky! MassiveMusic features our track Whale on their MassiveTalent blog this week. 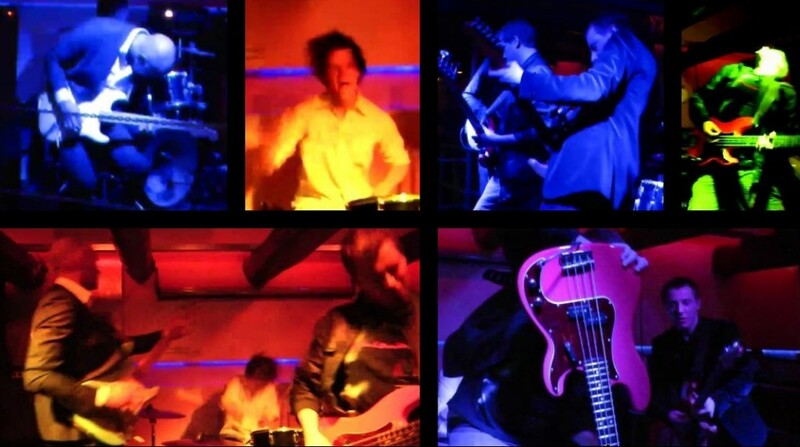 And finally an item in the exotic Dutch language, on MusicFromNL: Spaceguards uit in Amerika. September 12th 2012 – Banzai! It looks like we’re getting ourselves a proper European release in October. We are proud to add Germany’s coolest label Kamikaze Records to our distribution network today! We couldn’t agree more! Check Facebook for the complete review. Aren’t we a cool Amsterdam band, celebrating our USA launch one month before the official release date in The Netherlands! Surf ‘n space lovers from all over the planet can now order copies of our CD album MULTIVISION from USA’s finest: Double Crown Records and Deep Eddy Records. Check out some clips for a couple of the songs on our debut album MULTIVISION. An appropriate soundtrack to a legendary moment in surfing: Stampede. Skateboarding 70′s style: Whale. And some live action and space footage in Rio Jara. Or you could just visit our video page and watch these clips and more, like a special Spaceguards sighting in Russia. July 19th 2012 – MULTIVISION on CD! In April our debut album MULTIVISION became available on Bandcamp as download-only, but due to demand from all over the globe it will now become availabe on CD as well, spiced up with artwork from graphic designer Jane Mack. The release is planned for October 1st 2012. Fly in from outer space into Marky Wildstone’s wonderful surf related blog from Brasil. Check out this article on our new album on the Massive Talent website! Two Spaceguards songs, ‘Rio Jara’ and ‘Pluto’, are featured in the Volkswagen ‘Hitchhike with a Like’ Facebook game, a campaign for the new ’21st Century’ Beetle car, launched this week. Catch virtual rides, earn points, win prizes: Start playing here. Both featured songs appear on Spaceguards’ 9-track debut album ‘MULTIVISION’. Finally… It took us a bit longer than intended, but then again, we did upgrade the announced debut EP to a 9-track mini-album! We’re very happy with our firstborn and we hope you will enjoy it as much as we do! February 29th 2012 – Countdown begins! It was a great night last Saturday in Warhol, Groningen! We did our first show in a long time and played a load of new songs. Here’s an impression in photographs. Next mission: Podium Victorie, Alkmaar, February 10th. Hi there! We’re proud to announce that we have confirmation on our first show of 2012. From January 11 till January 14 the city of Groningen in the Netherlands is host to Europe’s biggest showcase event, with main festivals Eurosonic and Noorderslag. The alternative festival “A Rocket Ride To Grunn City” obviously has a way cooler name, so we’ll take the Rocket Ride. Our showcase: Saturday January 14, in Warhol, Groningen. More information here. Great news: it is done! We’ve completed the recording sessions for our forthcoming debut EP! We originally intended the release to take place in spring 2011, but we had to deal with some unexpected delays and an acute case of hernia, so we postponed the release and February 2012 is what we are aiming for at the moment. We’re not sure yet what to name our future firstborn, but we do know it will capture what Spaceguards is all about: the punkrock energy, the surf vibe, the indie feel, the ‘big city’ sound, it’s all there! We recorded everything in our high-tech studio, deeply hidden within the Amsterdam Spaceguards building. Expect soundsnippets, videoclips and the occasional free download in the weeks to come, so check this site regularly! September 6th 2011 – New website! Hey all! In our first year we managed to deal with a very basic website, which was actually nothing more than one picture (great picture though!). Now, with our first EP almost completed, we figured it was time for a new and improved digital home for Spaceguards. So here it is, take a look around and let us know what you think!